Maria Nila is a brand I have come to know through Beauty Boxes and one of the reasons I am still a fan of them is exactly for this reason. Without them, many brands within my arsenal would have more than likely never crossed my path. Maria Nila is one of those brands. 100% Vegan and cruelty hair care, the brands features shampoos, conditioners, masks and styling products but also has them specifically designed for everyday problems, so if you have colour treated hair there will be something for you, if you have blonde hair then there is the Silver Collection for you and so on. 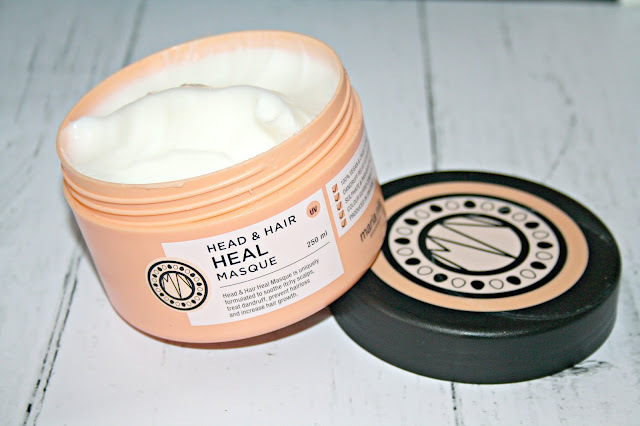 The product I have been using is the Maria Nila Head and Hair Heal Masque which came to be via the Vegan Limited Edition Glossybox (here) and I have become quite the fan. Described as being a multifunctional mask to promote a healthy scalp and stronger, shinier hair, it is also said to prevent dandruff and itchy scalps! It comes as part of an entire Head and Heal range of hair care featuring a shampoo and conditioner too. My hair is shoulder length and I am forever undecided as to whether or not this is my perfect length, whether I should grow it or go slightly shorter. To that end, I have really fine hair but a lot of it and it best described as being combination hair - much like my skin. With Oily roots and dry ends, I always try and find a product that doesn't strip my scalp but is moisturising enough for the rest of my hair and this sometimes means using two different products! This Head and Hair Heal Masque is anti-inflammatory and it uses Piroctone Olamine and natural Aloe Vera extract to treat and prevent dandruff and scalp problems, for me this is important because when I am stressed, feeling run down or have been poorly, it is usually my scalp that gives those telltale signs of being dry and itchy. Also included we have Vitamin E, Apigenin and peptides which together work to stimulate hair follicles for increased hair growth. Finally, there is Oleanolic acid which helps to prevent hair loss. To use this mask, you need just a small amount, it has quite a thick texture and a little goes a long way. Ideally, it should be applied to freshly washed hair and left to work its magic for up to 10 minutes before rinsing using warm water and then finishing by using a conditioner. 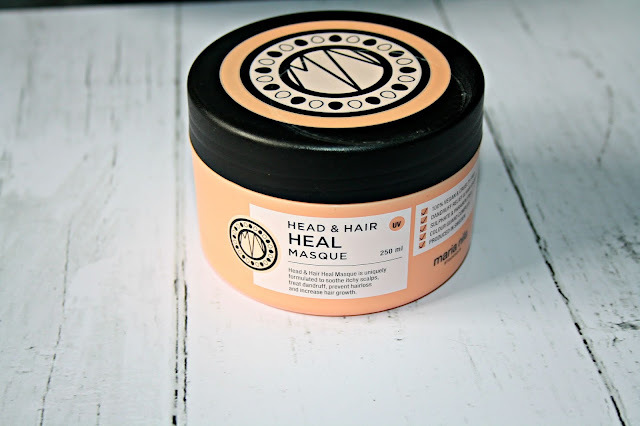 What I love about this mask is just how smooth it makes my hair feel from root to tip and how it doesn't irritate my scalp, infact, it is so soothing and calming that I've got a back up ready for when this one runs out. Have you ever tried any products from Maria Nila? Oh Wow that looks so good! Might need to pick up one! I've never heard of this brand before. This sounds fab. I need to invest in some more haircare products. This sounds like a really good masque. I have short hair which I colour, I also swim a lot so my hair is always in a bit of a sorry state. I'll look out for this, it sounds like just what my hair needs.